Throughout the 7 days there will be a mixture of talks, experiential exercises, chanting, meditations and tours to incredible temples. This experience is more than just a retreat; it has been carefully designed for people who really want to change their lives and have a complete holistic experience rather than just a holiday. The main aim of the trip is to help you find the truth of who you really are. Join Alexandra Wenman and Lorraine Flaherty of Freedom Through Wisdom, in Association with Stellar Folk, for an extraordinary exploration of the temples of our ancient origins. 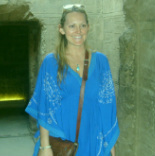 This trip is designed to give you the ultimate experience of the energy and wonders of ancient Egypt. Our tour revolves around the theme of the search for ‘The Truth of our Divine Origins’ and the awakening of the Divine Feminine. Along with exploring the incredible temples and monuments of the ancient and mystical land, there will be opportunities for group sharing, guided meditations, channelling and attunements and practical guidance to assist and support you in discovering your own Truth and Divine Origins. * DEPOSIT OF £1,111 REQUIRED UP FRONT TO SECURE BOOKING WITH REMAINDER PAYABLE 2 WEEKS PRIOR TO DEPARTURE. INTERNATIONAL FLIGHTS NOT INCLUDED.